Able Moving & Storage, Inc. prides itself on being an independent mover. Able was established in 1987, by Bill, Jim, and Joe Singleton. Like a lot of other successful moving companies, Able started with one truck out of the basement of a house. Over the past 30 years, Able has grown steadily. Today, it is a premier service provider in the Washington, DC, metropolitan areas, servicing both Household and Commercial clients. Having two distinct divisions enables our experts to properly service moves to and from anywhere around the world. Today, Able employs over 200 people, has a fleet of 75 trucks, and operates out of more than 200,000 square feet of warehouse space. Able Moving & Storage currently employs more than 200 employees. Able Moving & Storage employees have a direct stake in the long-term success of our company and in achieving complete customer satisfaction, making our success and continued growth possible. All supervisors and drivers come with appropriate endorsements in accordance with state and Department of Transportation (DOT) regulations, and each must complete Certified Professional Mover training sponsored by the American Moving and Storage Association (AMSA), and receive certification. All service and operations staff must complete specific industry and professional training before performing services for customers/clients. Project/Account Managers are trained in the planning and execution of relocations. Each must successfully achieve certification through the International Office Moving Institute (IOMI) and earn AMSA’s Certified Moving Consultant designation before they can represent Able Moving & Storage in this capacity. In addition to this qualification, our managers and customer service staff receive extensive training in providing customer service before, during and after the relocation is completed. Bill, Jim, and Joe Singleton started Able Moving. Like a lot of businesses, Able was started with one truck. Bill manned the phones, and Jim and Joe performed the estimating and the moves. A $300.00 ad in the yellow pages, and a mother who was a Realtor, were all it took to get the business off the ground. The economy was in decent shape and the Northern Virginia housing market was strong; the business needed a second truck by the end of the year. Able has steadily grown to a five truck operation, thanks to repeat customers and a handful of loyal Realtors sending over business. Able rents a small warehouse in Manassas, Virginia, and can now offer storage to its growing customer base. The steady growth allows able to purchase 15 acres, conveniently located right off route 66. The first warehouse, complete with office space, is finished. Able becomes affiliated with a major Van line. The transition was anything but smooth, and after 5 years Able left the Van line to go back to being fully independent. There is a major difference in the way a Van Line functions and Able Moving functions. 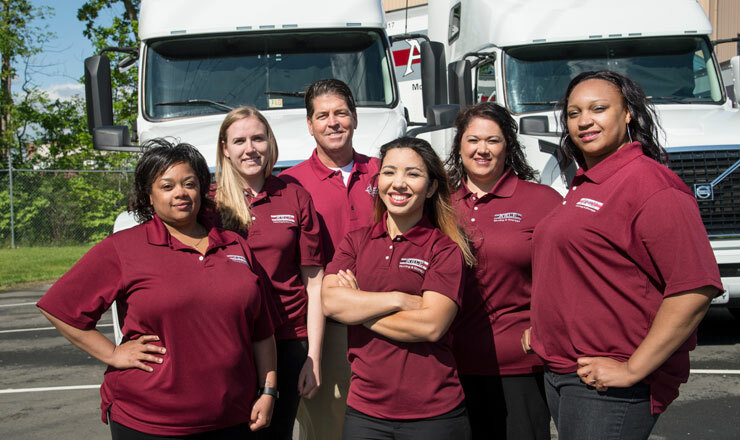 The main difference is that Able Moving’s success was (and still is) designed around using full-time, professional staff, while a van line encourages Agents to utilize each other’s staff for the driver. With that scenario, Able had no control over the quality or training of the workers involved, nor over the results and success of a move. A second warehouse is built, further expanding capacity. The economy goes into the tank and the moving business collapses. Able Moving goes on the defense and tries to keep all the good people that have given so much to the company over the years. Able is proud that not one person was laid off! Instead, the team all agrees to a wage freeze and suspends the company 401k match until times improved. Things do get better! Able Moving competes for and wins the Department of State Pack and Crate International contract. The contract is extremely demanding and the Department of State inspections very thorough. Being vetted by the Department of State and winning the Department and State Pack and Crate contract was the first major diversification of the business. The contract requires Able to pack, load, ship, and store household goods for the foreign service employees moving to posts all over the world. The third warehouse is built, expanding storage capacity. Further diversification ensues, and the demand for Office Moving is strong enough that Able creates a separate division complete with staffing, trucks and all the necessary equipment to handle the great businesses that continue to value Able Moving’s services. Able becomes an international freight forwarder to extend the company reach worldwide. Construction begins on the 4th and final warehouse that can be built on the property Able purchased over 20 years ago. March of 2017 is the 30th anniversary of Able moving. The 4th warehouse opens and expands our warehouse capacity to over 200,000 feet. In just a few short years, the office moving division is now employing nearly half the staff, regularly dispatching over 100 supervisors, project managers, drivers, helpers and packers on a daily basis. In October 2018, Able Moving purchases five acres of its future warehouse, and the new Commercial Division warehouse is leased. Able teams up with the non-profit organization, Move For Hunger, to collect non-perishable food items and deliver to food banks around the Northern Virginia area. Able is awarded the American Moving & Storage Association Independent Mover of the Year, for providing outstanding independent moving services to customers and the community. By centering the focus on the company’s mission, vision, and values, Able Moving launches the You2 Movement and raises the standard for Northern Virginia independent moving companies.